The ribbon is a new container for all the commands that used to be inside toolbars, and more. It's docked on the top of the window and contains most commands and options grouped into several categories which appear as tabs. 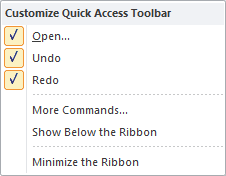 This menu allows you to customize your Quick Access toolbar, move it below or above the ribbon, or minimize the ribbon. More information about these functions and the Quick Access toolbar is available here.